SHRII is pleased to present a surshringar concert featuring Kolkata multi-instrumentalist Somjit Dasgupta. Considering that there are less than 20 surshringar players worldwide, this is a very rare opportunity to see a surshringar, let alone experience a surshringar performance. The event will take place outdoors in a lush floral garden featuring waterfalls with Mt Hood and Mt St Helens as a natural backdrop. 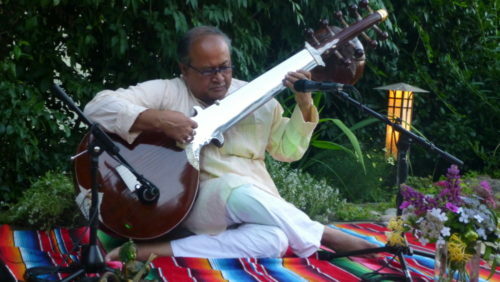 Somjit Dasgupta is one of the leading performers of sarod, rabab, sur-rabab, mohan veena and surshringar, the playing techniques of which he learned from his late mentor Pandit Radhika Mohan Maitra, the second most recorded artist by All India Radio and one of the foremost musicians of our times. Somjit has performed around the world and at many Indian Classical Music festivals. Unlike the majority of professional musicians, particularly instrumentalists, Somjit Dasgupta does not come from a family of professional musicians. As a child, he was fascinated by a large collection of musical instruments that his grandfather, a gentleman of leisure and taste, kept at his estate in what was once called East Bengal, then East Pakistan, and now known as Bangladesh. As a young man, Somjit’s family moved to Kolkata. At the age of 10, his father began teaching him to play the sitar. After a few years of instruction, he attended a sarod performance provided by Radhika Mohan Maitra which lasted six hours. He was so moved by the performance that he decided to take up the sarod as his instrument and set out to obtain instruction from ‘Radhu Babu’ as most people called Radhika Mohan Maitra. However, given Radhu Babu’s stature as both a musician and Zamindar, he was highly inaccessible to the public. Radhika Mohan Maitra lived close to the Jadavpur University Campus in Kolkata in a sprawling bungalow becoming of a rich zamindar (big land owner) while he had also rented another house nearby for his disciples and guests. This is where the young Somjit, aged thirteen, visited Radhu Babu and pleaded to be taken as a disciple. To his surprise, Radhu Babu readily agreed. After consulting the Panchang, the Indian astrological calendar, he asked Somjit to return in 20 days with a sarod. Somjit was exceptionally fortunate that he was able to learn directly from Radhu Babu for the usual course was to begin under the tutelage of a senior disciple. Rather, for Somjit, from the day he began training, he stayed at the house of Radhu Babu. He lived with Radhika Mohan Maitra for eight years till Radhu Babu passed away on October 15th, 1981. Somjit Dasgupta has developed a style of playing the surshringar, rabab, and sarod that is a genuine reflection of his teacher Radhika Mohan Maitra. His tonal movements are extremely fluid and incorporate heavy use of the drone strings, which are nicely suited for the surshringar. It is uncommon for him to promote tension producing intervals or dark tones. Rather, he commonly evokes a peaceful meditation that slows the mind and opens the heart. Somjit is the keeper of over 200 historic musical instruments, which include many of Radhika Mohan Maitra’s instruments. The collection includes 3 different styles of surshringars one of which was owned and played by Wazir Khan, two sitars which were presented by the Dhaka nawab to Radhu Babu, several instruments invented by Radhu Babu such as the Dilbahar and the Mohan Veena, and a number of veenas. Somjit has begun restoring these instruments and intends to create a living heritage in which students can learn about the instruments, the musicians who played them, and the dhrupad music to which they were intended.